The University of Bremen is a public body which is legally represented by the Rector Prof. Dr.-Ing. Bernd Scholz-Reiter. 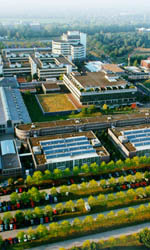 The AGRA is a group of the University of Bremen. The Group assumes no responsibility whatsoever for the accuracy or integrity of the information which can be viewed on their internet site, nor do they guarantee that all information is completely up to date. Always provided that the Group is not proved to have been wilfully or grossly negligent, the Group will not accept any claims for damages, of either a material or immaterial nature, which may be caused by the use or otherwise of the information provided, or caused by acting upon false and inaccurate information. The Group expressly reserves the right to amend, supplement, delete or close down certain pages or the entire site without prior notice. The Group has no influence whatsoever on the current or future design or content of other internet pages which are either directly or indirectly referred to on their site (links). The Group therefore expressly disassociates themselves herewith from anything contained on any linked pages. With regard to publications, the Group is obliged to uphold the authors’ copyright concerning any graphics, audio recordings, video sequences and texts which may be used. The Group endeavours only to make use of graphics, audio recordings, video sequences and texts produced within the Group themselve, or to draw on freely licensed graphics, audio recordings, video sequences and texts. Unless the material is clearly stated to be freely licensed, it is prohibited to reproduce or use any graphics, audio recordings, video sequences and texts displayed on the internet pages of the Group in other electronic or printed publications without having obtained the prior consent of the author concerned. The online documents and websites including their parts are protected by copyright. They may only be copied or printed for private, scientific and non-commercial information purposes provided that reference is made to copyright. The Group reserve the right to withdraw this permission at any time. It is prohibited to reproduce, archive, save on another server, include in news groups, use in online services or save to CD-ROM without the prior written consent of the Group. They may, however, be copied into a cache or a proxy server in order to optimise the access time. We expressly permit and welcome our documents and web pages to be cited, as well as links pointing to our website.